This startup story features Steve Ells, the founder of Chipotle. Ells who graduated from the Culinary Institute of America, dreamed of opening a fine-dining restaurant but ran into the problem most entrepreneurs face; lack of funds. In 1993 he opened Chipotle as a way to make money to fund his fine-dining restaurant. The idea took off and Chipotle with its foil wrapped burritos gained a cult following, propelling the company to over $826 MM in revenue with over 37,000 employees. Famous For: Inventing fast casual dining and it’s use of organic ingredients. Ells had attended the University of Colorado and later the Culinary Institute of America. After graduating, he worked as a sous chef at Stars Restaurant before leaving to launch Chipotle in 1993. Then 28, Ells created Chipotle to help him fund a fine-dining restaurant he had dreamed of. The restaurant quickly gained traction with it’s fast yet quality food service and began to gain a cult following. Watch the full interview with Chipotle Founder Steve Ells below. 1993: With an $85,000 loan from his father, Ells launched the first concept. Within one month, the store is selling more than 1,000 burritos per day. 1995: The second store opens using the cash flow of the first restaurant. 1996: Third store opens using an SBA loan. To fund more growth, Ell’s father invests an additional $1.5 Million. Ells then creates a board of directors and raises an additional $1.8 Million. 1998: McDonald’s invests $360 Million into Chipotle, allowing it to rapidly expand. 2001: By 2001, McDonald’s has become Chipotle’s largest investor. 2006: Chipotle goes public and the stock rises 100% in the first day. McDonald’s fully divests from Chipotle. Chipotle was almost an immediate hit and began seeing profitability within months of launching the first restaurant. 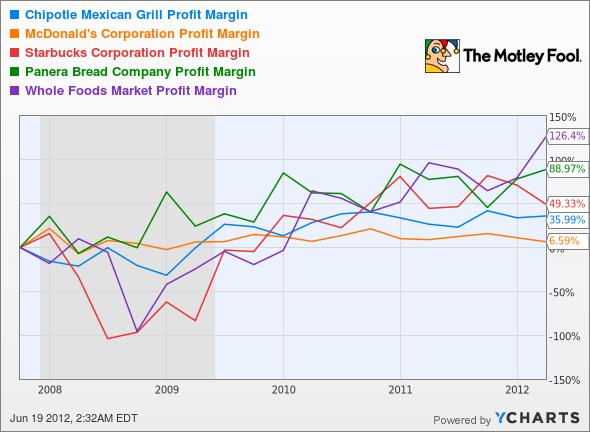 Below is a chart that depicts Chipotle’s profit margins vs. other major chains. Despite it’s continued focus on sustainable ingredients, the company has been able to maintain profit margins around 35.9%. 1993: Steve Ells launches the first Chipotle in Denver, Colorado. Within one month, it is selling 1,000 burritos per day. Ells original goal was at least 107 burritos per day. 1998: McDonald’s becomes an investor in Chipotle, helping the company expand rapidly. 2006: Chipotle goes public, providing liquidity to it’s earlier investors, employees, and executives. McDonald’s makes more than $1 Billion on it’s investment in Chipotle.